A ban on the sale of alcohol below a minimum price will be introduced in England and Wales from 6 April 2012. Shops and bars will not be able to sell drinks for less than the tax paid on them - a move the government says will cut crime. It works out as 38p for a can of weak lager and £10.71 for a litre of vodka. Health campaigners say the price "floor" is too low to have any impact, but the drinks industry has described it as a "pragmatic solution". 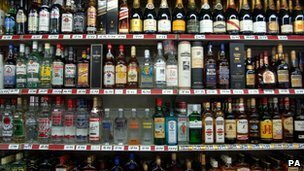 The move comes as the Scottish government presses ahead with plans to introduce a minimum price per unit of alcohol. Its first attempt to do so, setting the price at 45p per unit, failed during the last Parliament, but MSPs have now reintroduced the bill and say the measure is needed as part of the "battle with alcohol misuse". Anne Milton, Public Health Minister at Westminster, told a Commons committee last month that a minimum price per unit was "probably illegal" under European trade laws and would be challenged in the courts. But she said the government was in "on-going discussions" with the Treasury on how further price manipulation could be used to encourage safer drinking. The pledge to ban the sale of alcohol below cost price was part of the coalition agreement and will mean that drinks must cost more than the rate of duty plus VAT. Home Office Minister James Brokenshire has described the move as "an important first step" which will prevent around 7,000 crimes a year - 2,000 of them violent. But the British Medical Association says it will make little difference. A spokesman for Alcohol Concern said: "The new provision must be welcomed, as it will hopefully make some difference at the very extreme cheap end of the market favoured by street drinkers and the young. "Unfortunately, the majority of problem drinkers are unlikely be affected - the approval to the scheme on behalf of the drinks industry probably indicates that they are not expecting a huge decrease in sales." Campaigners would like to see a 50p-per-unit minimum - something researchers at Sheffield University have estimated would mean that after a decade there would be almost 3,000 fewer deaths every year and 41,000 fewer cases of chronic illness. 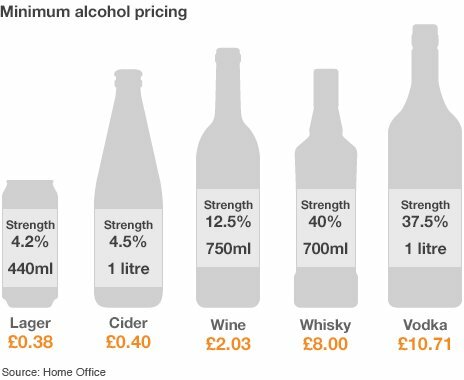 The government's measure will translate to about 21p per unit of beer and 28p per unit of spirits. The lowest possible price of a can of lager would range from 38p to 78p depending on its strength, but most drinks would be unaffected. Opponents of a minimum unit price say it is unfair because it penalises all drinkers, not just those who cause or have problems. Gavin Partington, of the Wine and Spirit Trade Association, told the BBC News website: "We always said that duty plus VAT was the least worst option. All the other pricing mechanisms have problems with them, mostly of legality. "I know some opponents say it doesn't tackle enough alcohol products. That may be true, but what it does do is prevent anybody using alcohol as a loss leader which has happened in the past. "That has to be a good thing for both the consumer and the trade. Nobody wants to see stuff at rock bottom prices."